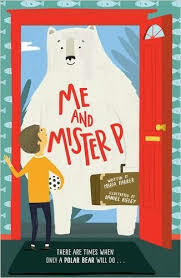 Me And Mister P by Maria Farrer and illustrated by Daniel Rieley is an absolute joy to read. It's incredibly funny, warm and tender all at the same time. ‘There are times when only a polar bear will do . . .
All I want is a normal family but no, I've ended up with the brother from Weirdsville. Liam is so embarrassing, but Mum and Dad can't see that and give him all the attention. Leaving me with zero! Zilch! A big fat NOTHING! Arthur struggles with his younger brother’s special needs. He’s embarrassed of Liam’s behaviour and resents all the attention he gets. Yet as soon as the bear turns up in Arthur’s life, you have a feeling everything’s going to be OK.
Mister P is possibly one of the greatest bears I’ve ever met. Even though he doesn’t utter a word, he says so much. (A huge well done to Maria for achieving this!) He’s quite a nervous bear - not used to spiders, cars and school - and so Arthur goes out of his way to make Mister P feel safe and secure. Through Mister P, Arthur begins to see the world through Liam’s eyes – how loud noises and new experiences can be frightening. Furthermore, Arthur starts to appreciate and enjoy his younger brother’s fun, quirky qualities. There are so many magical moments in this book from Arthur teaching Mister P keepy-uppy to polar bear dancing. And I loved how so many of the characters just accepted a polar bear in their midst, as if this wasn’t anything out of the ordinary. The illustrations by Daniel Rieley are fabulous, adding warmth and humour. I adore Mister P’s expressions, especially the one where he sees the spider for the first time. The layout of the book is really interesting too, with different sized text, making it very accessible. This is such a special story, relishing how we are all different. It's filled with empathy and compassion, while making us roar with laughter. It's aimed at children 6+, but I think any age will enjoy it. Hope the ring at the doorbell happens soon, Tamsin!